« More bikes/ less cars in Edinburgh rush hour – and why? The handout is aimed at politicians, officials and others who are in a position to influence final decisions on cycling investment for 2012-13. We urge all readers to make best use of the handout. If you need to print it, don’t click on the graphic opposite but instead use this higher quality pdf version [761k]. 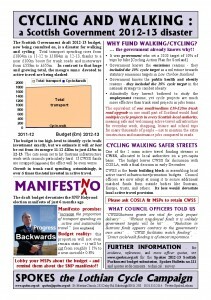 For more information about the draft budget, and how and why it will devastate cycle projects in Scotland, see our news items Budget Update and Spokes Bulletin 111. 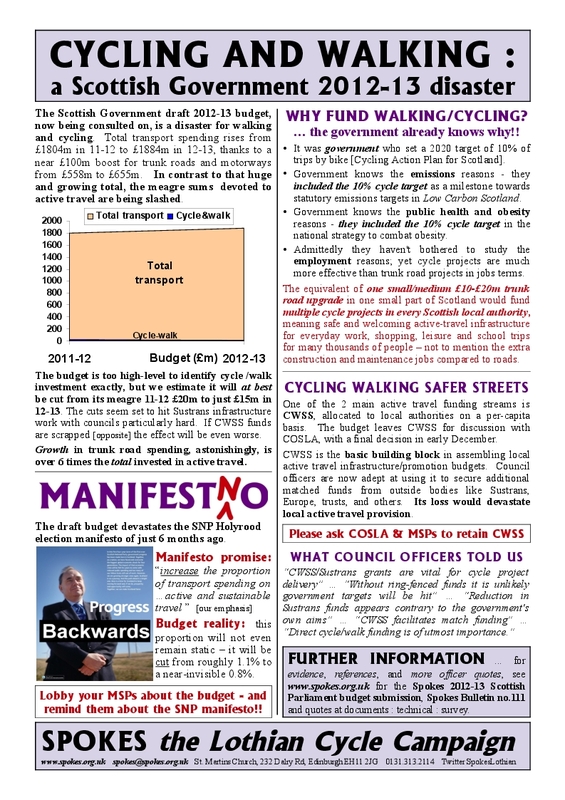 If you care about provision for cycling and walking – please lobby your MSPs about the draft budget urgently, whilst it is still out for consultation. Remember that you have one constituency MSP plus several list MSPs – you can contact them all at www.writetothem.com.